The Wounded Knee Massacre site is up for sale by a private owner, James Czywczynski, who is non-Native. Ownership of this land was stripped from the people of Pine Ridge by the Dawes Act of 1887. It is not theirs to sell, GIVE IT BACK! Signed. This land belongs to the Oglalla Sioux Tribe. It is their heritage. It is their history. It's only right that it be given back to them. The United States can find billions to fight wars that we don't need to be in, I'm sure it could find money to make a wrong to be more right. But then that would make sense and be the correct thing to do.....I won't hold my breath. Signed and noted. This land was stolen and needs to be returned! So signed! Thanks AniMaeChi for forwarding. Ty Cal for finding this petition and AniMae darling for spreading the word! def signing. I also reserve the feeling like Dandy-1. Sadly this land is historical value both Native and Non so this should be a no-brainer for the federal Govt. But, sadly, look at the administrations values. Land and animals and rights? bahhhh! Noted, signed, twittered, fb and google shared. Thanks Cal for posting and Ani for forwarding. I have very strong feelings about this and agree with Roxy and Dandelion. Thank you to everyone who signs. Signed, noted, Facebooked it. Thanks Cal. Absolutely. I signed. Thanks, Cal for this. Signed with pleasure! Thanks, Cal. Signed and noted. Wounded Knee has been paid for in blood. It is their heritage and their land taken by cruelty, treachery and violence. It is time for the American Congress to give it back to it's rightful owners. Good luck and God Bless. Noted, signed and shared. Thank you. Signed, noted and shared on facebook. Many, many thanks to Cal for posting. 핾햎햌햓햊행 햆햓행 햓햔햙햊행. 핿햍햆햓햐햘 핮햆햑! Noted, Signed and Shared!! I to agree that this land belongs to the Sioux Nation and Should be "RETURNED"!! Let's step up and do the RIGHT THING!!!! Thanks Cal and AniMae!! Thanks AniMaeChi for the fwd. and Cal for posting. Yes of course I signed (again) and will continue to add my voice to ensure that the rightful ownership of Wounded Knee is in the hands of the people of the Sioux Nation. I send prayers for this to happen ... sooner than later . . . .
p.s. I am celebrating the Jewish New Year and Days of Awe right now so please do not send me petitions to sign until after the 15th of September. Thank you my dear friends. Noted and already signed and shared my Beloved Friend, AniMaeChi. HAVE A VERY BLESSED DAY EVERYBODY!!!! I mean my Beloved Cal. Stay Blessed you and yours Always!!! with 16,636 supporters , thx Cal and Sioux! Shame on greedy old Czywczynski and the govt. Gladly signed. 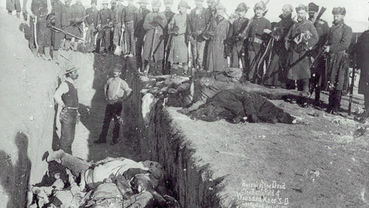 James Czywczynski has no right to profit from the massacre at Wounded Knee. But of greater importance is the return of the land to the Sioux people. This is sacred land. Signed, thank you, Cal ! Thanks for signing "Purchase Wounded Knee, SD to return to the Sioux Nation" Thank you AniMae. Noted and signed ~ Thank you Cal! S&N Give it back, it is really theirs anyway! Signed and noted. Thanks for sharing, Cal. the government needs to stop taking things from Native Americans and give them back. The land belongs to the Sioux Nation. Please return the land to them now. Signed with 17,800 supporters, 482,200 NEEDED. Who are the "Indian givers",(such a horrible and misunderstood term) NOW!!!!!!!!!!!!!!!????? KEEP BROADCASTING THIS CAL ! ! ! ! ! One of our many American disgraces to the Native American. Signed & noted. Thank you, Cal. Shared too, I forgot first. Gladly signed, noted & shared. This country spends trillions of dollars to fund wars we don't want to get involved in, billions to aid foreign countries, most of them hate us, too. They take the money with one hand, then stab us in the back with the other one. For example: Pakistan and others. But they can't RETURN what rightfully belongs to the Sioux Nation? Many Native Americans have ancestors buried there. That's sacred ground. Give it back to the rightful owners, the Native Americans. Do not add insult to injury, by asking them to purchase it. Thanks, Cal for posting this, and thanks, dear Charmaine, for forwarding. Tried to sign it but couldn't for some reason. I'll try tomorrow with fresher eyes and a more current computer. Thanks Cal. Signed and noted. Signed & Noted, Thanks AniMaeChi! So Noted, signed & shared. Signed! Thanks Cal and thank you Marie for sharing! It was obtained in a bloody criminal act, it should be given back to the rightful owners! Thanks for signing "Purchase Wounded Knee, SD to return to the Sioux Nation"
Signed with hope somebody does the right thing. Thanks Cal, signed and noted, I hope the land is returned to the rightful owners! Signed & noted..... The only RIGHT thing to do! signed, noted, tweeted & facebooked.... too bad we can't Pin it to Pinterest... I would have done that also! Notato e firmato. Grazie Cal. If u drunk Surge in 90' s and remember it. like to drink it again one day please like The Surge Movement Facebook page.